Sometimes, Yancey and I are at home together during lunchtime. On a weekday. Among the activites that sometimes commence (wink wink), salad-making is one of them. But no. I wake up thinking about the three meals in front of me and how to make something with whatever is in my fridge. And Yancey benefits. I'll say, "I'm making a salad. Do you want some?" He'll answer, "Umm....I guess so." He doesn't feel hungry, necessarily, and if I weren't around, he probably wouldn't eat lunch. He'd have an apple at 3:00 and call it good. But if I'm home working during the day, I love the opportunity to get some vegetables in. At the hospital (where I'm doing a lot of consulting these days), I grab a sandwich or a cup of grapes from the cafeteria. It's a treat to make a mess and eat something interesting. 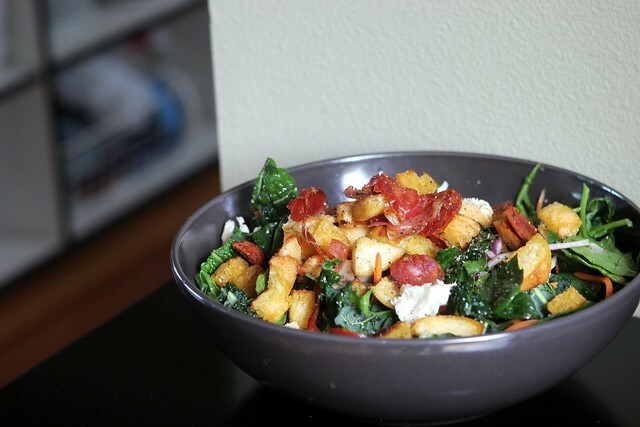 Fill a medium salad bowl with washed and chopped lacinato kale (or other greens). Mix in julienned carrot, thinly sliced red onion, roughly chopped green olives, and chunks of smoked mozarella or feta. Then heat up a heavy skillet and pour a big glug of olive oil in. Add some big chunks of fresh crusty bread and a handful of chopped chorizo and fry them together with salt. Everything will turn crispy and a little bit orange. Dump that hot mixture in with your greens, and toss the whole thing with white wine vinegar, olive oil, and salt. And if you're lucky enough to have a cutie husband around, give him some too even though he says he's not hungry. Don't believe him. P.S. A giant THANK YOU to everyone to voted in Saveur's contest and who called, texted, or commented to say congratulations. What I got out of the whole thing (no word on the winner yet) is that 1) I am loved and appreciated and 2) This blog is going to be around for a long time. I've instituted a Monday night ritual around here. I make dinner for my parents, and it's a highlight of my week. They are an appreciative audience--tired from work, happy to not be cooking and cleaning, and complimentary. 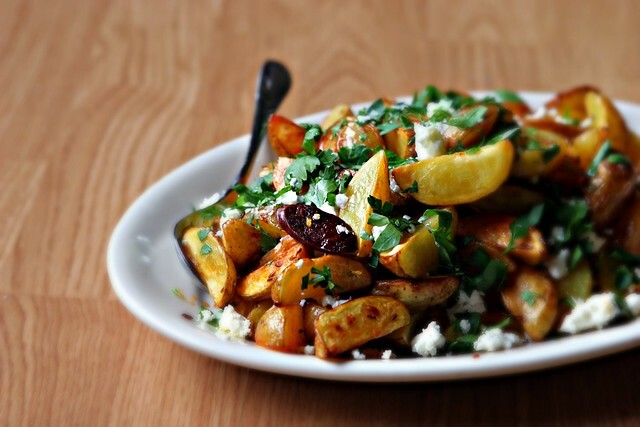 This week, we had sausages, these delectable potatoes, and an arugula and ricotta salata salad. I couldn't believe how fast we polished off that mountain of potatoes. Seeing Jason Quick perform at Wyatt's daycamp. He's a one-armed juggler, therapist, and circus arts instructor who lost his arm in an electrical accident when he was six. He learned to play games by himself, and he learned to never give up. I was so inspired watching him and so sheepish about how easily I give up on things just because the red carpet might not be laid out. I'll give you a silly example. We just joined the YMCA, and am notoriously clumsy and bad at sports. But they have a rock climbing wall, and I want to learn. And they have a racquetball court that looks fun. Don't let me get away with not trying those things just because I might not be excellent at them. Taking an early-morning spin class at the Y, sweating it out with strangers and feeling exhausted afterward. Some coaching sessions with clients when I can almost see them growing right in front of me. There is nothing better than that. Meeting my childhood friend Sam's little girl, who stole my heart immediately. Late nights with Yancey, eating our way through a bag of potato chips and talking about spray foam insulation, window packages, and flooring options. Our house closed yesterday, and the sledgehammers are poised. A visit from Emily and Ricky yesterday and some time with Emily to talk about our friendship and how we'll navigate this new terrain. And I haven't forgotten. Here's those potatoes. Heat oven to 425 and line a baking sheet with parchment paper. Wash 2 pounds small yellow potatoes. If they're on the small side, halve them. If they're bigger, quarter them. Put them in a large bowl with a couple big glugs olive oil, a generous pinch of kosher salt, a teaspoon of cumin seeds, and a big handful of chorizo sausage coins. (Spanish chorizo--the cured, ready-to-eat, usually bright red sausage, available at good delis.) Dump the mixture onto your baking sheet, and bake for 20-30 minutes until potatoes are crispy on the outside, soft on the inside, and chorizo is crisped up. Mound on a platter, and garnish with a handful of chopped parsley and a handful of sheep's milk feta. And a little more salt. Remember when I went on and on about my wok? With romantic metaphors, even? I suppose we are past infatuation and into the settled domestic partners stage. The patina is developing as planned, and I can now fry rice, noodles, or meat without any fear of sticking. I've often thought what a wonderful gift it would be to season a wok for someone else. But I don't want to give up cooking with mine. I haven't posted a ton of wok recipes because most the things I make in it are so completely and utterly everyday. I'm not sure there's a lot of interest in a fried-rice-a-day calendar. I've sizzled a few delicious numbers, but it's too damn dark at night for decent photos. So you'll have to trust me on this wok thing. The fact that I am self-employed. My addiction to cleaning out the fridge. The hard work I put into cleaning and prepping vegetables (a ritual part of every weekend around here). My habit of cooking up some kind of whole grain (brown rice, in this case) and having it in the fridge all week. PCC's stocking of chorizo in the deli. Real stuff. I couldn't get it in my neighborhood before. Dangerous. My ongoing commitment to use my wok almost daily. This is a very serious relationship. Have I mentioned I'm on another health kick? Choosing whole grains over stripped ones, working to get all my servings of fruits and vegetables in, watching my portion sizes, cutting down on sugar and fats. I'm thankful for this body that has such grace for me and responds so energetically when I take care of it. In this season of overeating and constant indulgence, this is my little rebellion. Serves as a light lunch for two. The important thing with fried rice is that your rice is cold--it's been in the fridge for at least a few hours. For this reason, I always make more than I need and refrigerate the rest. And using brown rice here is no sacrifice--I think it makes a much more delicious version. If you don't have a well-seasoned wok, a large nonstick skillet will work. And you can certainly use other veggies here--peppers, green onions, carrots. The important thing is that they are cut to uniform size. Heat your wok on high until a drop of water flicked into it disappears instantly. Add oil, swirl to coat, and add cumin seeds, red pepper flakes, and garlic. Stirfry with a metal spatula for 10 seconds, stirring constantly. Add chorizo, zucchini, cabbage, and kale, and stirfry to 2 minutes, stirring constantly. Add salt and rice and cook for 2-3 more minutes until rice is warmed through and vegetables are getting crispy in places. 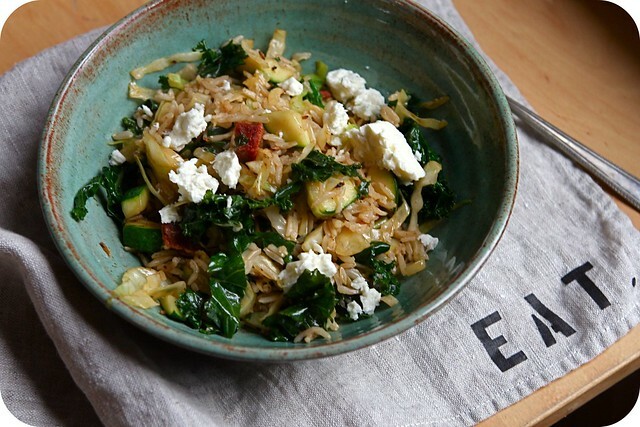 Dump into two bowls, squeeze some lemon over, and top with a bit of crumbled feta.